It’s a rainy, cold day for most of us East Coasters. 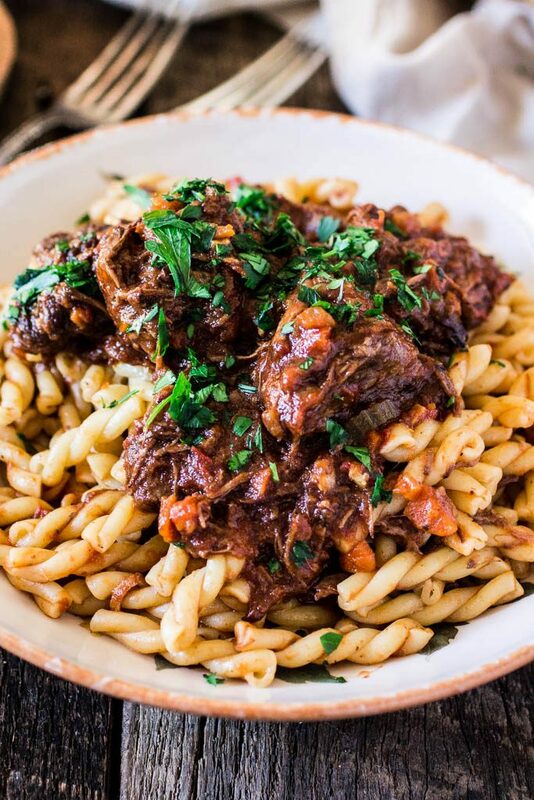 For me, that means huge cravings of warm, comforting dishes like this Braised Beef Ragu with Gemelli! Tim and I returned from our mini getaway to Woodstock last Tuesday and are already back to our dreadful crazy routines. The trip was short but amazing and left us wanting some more. We ate a lot of good food – more on that on a future post -, rested and even did a little exploring of the woods with our dog Lola. No, I didn’t actually see any black bears but just the sign saying “beware of black bears” is enough to spook this city girl! ? It doesn’t help that Tim made me go into the dark woods at 11pm, in search of this so called Magic Meadow. Apparently, according to our pizzeria waiter, a bunch of hippies were gathering to celebrate the Lunar Eclipse and we thought we should join and be more adventurous. Needless to say that after we wandered Blair-witch-style through the darkness for about 20 minutes, I begged until he agreed to go back. A glass of wine in a cabin full of bugs is as adventurous as it’ll get with me, sorry babe! But anyways… I’ll talk more about Woodstock later. 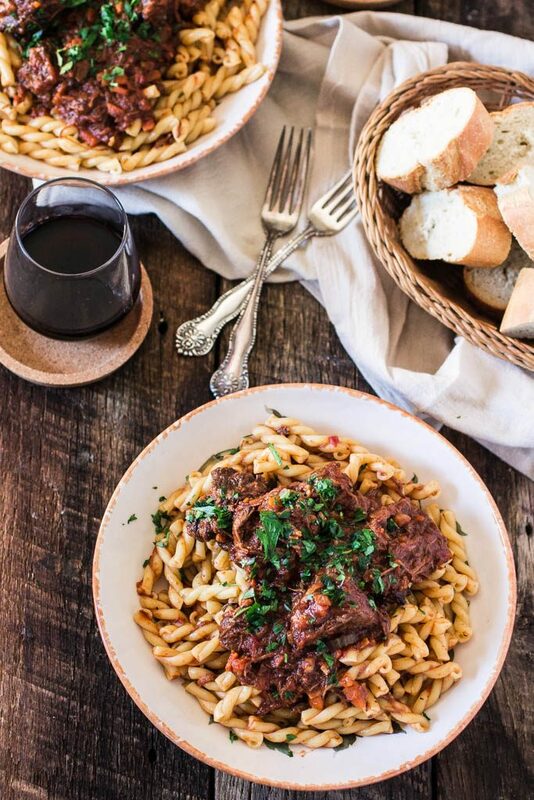 Right now let’s focus on this cozy, warm Braised Beef Ragu that requires little work and cooks itself for 3 hours in your oven. I’ve been making this recipe for a while now and after tweaking a thing or two I think I finally found perfection. The beef cooks until it falls apart at the touch of a fork. The tomato based sauce is flavored with a classic Italian soffritto (onion, garlic, celery and carrots), red wine, balsamic vinegar for a little sweetness, and some fragrant herbs (thyme, rosemary and sage)! I know beef ragu is often served with long pasta, like pappardelle of fettuccine, but I really like how the sauce gets inside all the little nooks and crannies of the Gemelli. I originally wanted to serve it over cavatelli, but couldn’t find any, even at NYC’s famous Italian emporium, so I went for the Gemelli instead. I’m glad to report that it didn’t disappoint! To be honest, this beef ragu is so amazingly delicious that it can be served over any pasta, polenta, rice or even eaten by itself with some bread! Just make sure your pasta is al dente… Nothing worse than soggy pasta! Other than that, be prepared to do some browning and sautéing but then relax waiting for your dinner. It’s a great opportunity to invite some friends over, as this recipe feeds a small crowd. Better yet if they have an appetite, because Italian food is not supposed to be consumed in moderation! ? Heat the olive oil on a large oven-proof Dutch oven over medium high heat. When the oil is sizzling hot, brown the meat on all sides, about 5 minutes, working in batches if necessary. Remove the beef from the pot and reserve. Reduce heat to medium. Add the onion and garlic to the same pot and sauté until fragrant and beginning to brown, about 2 minutes. Add the carrot and the celery and sauté until the vegetables are softened, about 5 minutes. Add the flour and the tomato paste, stir and cook for a minute to get rid of the raw flour taste. Then add the balsamic vinegar and cook, scrapping the bits off the bottom of the pot with a wooden spoon, until almost all gone, about 5 minutes. Add the red wine and simmer until reduced by half, about 5 more minutes. Meanwhile, prepare bouquet garni by tying all the fresh herbs together with a kitchen string. When the wine has reduced, add back the browned beef and the bouquet garni. Add the crushed tomatoes and the beef stock. Bring the liquid to a simmer over medium high heat. Then, cover the dutch oven and transfer to the preheated oven. Cook for 3 hours or until the beef is very tender. If the sauce is too liquidy at the end of the 3 hour cooking period, remove the beef and bring the liquid to the stovetop, over medium heat, to simmer until thickened to your likings. Shred the meat into smaller pieces and return to the pot with the sauce. Taste for seasoning and adjust salt and pepper if necessary. Cook the pasta, according to package instructions, until al dente. Drain the pasta, reserving a little of the pasta water. Spoon a little of the tomato sauce over the pasta and toss, adding pasta water if necessary. Serve the pasta with the ragu (and some more sauce). Sprinkle with the chopped parsley and serve with freshly grated Parmigiano Reggiano. Wow this is definitely a perfect recipe for fall because this cozy and warm braised beef. I love be in the woods and I hope one day I can visit Woodstock. I’ve heard a lot about this place. I am glad you had a relaxing weekend, friend! Thanks, Claudia! Ragu is my favorite comfort food. It is perfect for fall and winter! Wow! You had such an awesome weekend. This dish looks super yummy, Olivia! wow, I want/need this right now! 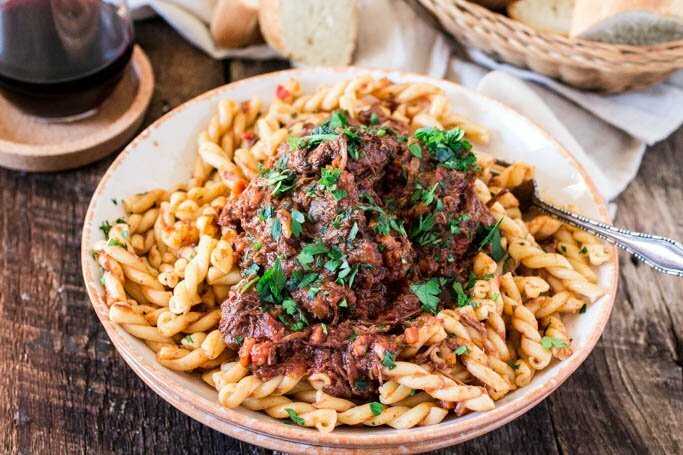 Your Ragu looks incredible! I would love it on this pasta and then slathered on pieces of crusty bread for good luck! How lucky for you that you didn’t run into any bears on your recent adventure in the woods. I wasn’t so lucky during my first trip to Montana. I was there on a business trip and decided to go for a walk all by myself. I was bending down admiring the wild flowers when I heard a rustle. I looked up and there was a rather large male black bear standing directly in front of me. Fortunately he was equally startled to see me and ran off into the woods. It makes me cringe to think back how unprepared I was for this (at the time. . .I was completely oblivious to the thought of running into wild animals). But enough about bears. . .this ragu looks absolutely divine. You can tell by the picture that the beef is so tender that it falls apart the moment the fork touches it. A must make. I am chuckling. I lived near woodstock for 10 years and we did see a few bears here and there. Scary, yes–but kind of cool. Love this ragu! Love the hearty ragu. So much flavor from using chuck roast. Great noodle too. WOW! What a bowl of delicious comfort. I just love it! Oh WOW! 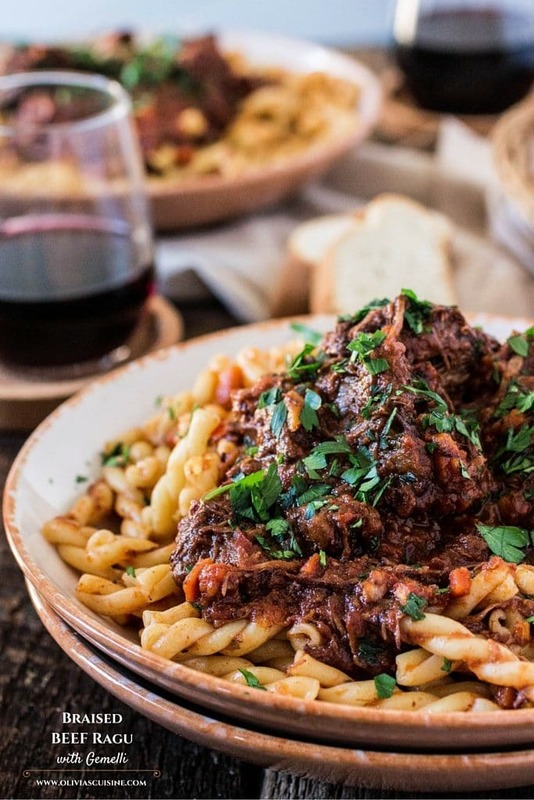 This braised beef ragu and that glass of red wine are exactly what my Friday night needs! Gonna have to make a run to the store after work to get the ingredients! YUM! It looks AMAZING! The Gemelli’s a great touch indeed. I too am a city girl. I stick as many insect repellent stickers as I can when I go into the ‘jungle’. Oh and… please give some of your rain to us ‘West Coasters’. Haha. Oh, hey, it’s a cold and rainy day in Boston as I read this, so I should just make this now. <3 I just made a lamb ragu earlier this week, but I'm okay to eat another tasty ragu again! Your photos are gorgeous as always! This is comfort food in its most perfect form! This looks absolutely incredible, and I wish I had this for dinner. Ummm…comfort food that you can eat and eat and eat!!! I love a good ragu sauce and your version looks awesome! This looks great, but any suggestions on how to make it without a dutch oven? Any oven proof pot will do, as long as it has a tight fitting lid to keep the moisture in. This ragu sounds amazing! Definitely right up my alley! Made this last night, a wonderful dish. Did make a couple minor adjustments. Used mushrooms, fresh (because I had some on had) and dried wild – I also added the soaking water. Also, no beef broth do just used chicken instead. A very hardy and robust dish. And not to mention easy! Definitely making this again. Hi there! I would like to make this for a dinner party. Do you think I could make it ahead of time and just reheat the day of? Any suggestions would be great! I’ve made this recipe several times for my family and it’s definitely a favorite.The sauce even freezes well for a quick last minute weeknight meal. Oh dear, what an amazing recipe. I made this for a friend the night before Thanksgiving and it looked good, smelled good, and the taste was really impressive. He took the leftovers to his family Thanksgiving and people were skipping turkey to have this instead and asking him how” he” made it. I did take the time to reduce the sauce and I think that made all the difference. Thank you for another great recipe and for the beautiful tip on presentation. This is a follow up question to my last comment. This sounds kind of silly but if I double this recipe would I still double everything, including the balsamic? 1/2 cup of balsamic seems like it might be overwhelming. Thanks! Can I substitute something for the red wine? I was just scrolling through pinterest, found this recipe and decided to make it. Holy…cow. I took one bite and my eyes closed in happiness. There was no way you could not savor that first yummy bite. I do not usually write comments, but I just needed to say that this dish was amazing and I am so thankful it exists. You rock! I made this tonight and it was delicious. The sauce was absolutely decadent. Thank you for an amazing recipe. I just came across this recipe and wanted to know if I could use dried herbs in place of fresh. I do not have a store close to us but do have all of the herbs dried. Hi! Can this be made in a slow cooker? Hi Ellen, yes it can. I’d do the browning, sautéing and reducing wine on the stove and then transfer to the slow cooker! I adapted this to the Instant Pot for 45 minutes on High Pressure and it was a great no heat the house summer dinner too! Hi Olivia. I would like to make this one week in advance of serving. Will it be OK in the refrigerator or should I freeze it? Thanks!